In Britain, the two main umbrella organisations for American Civil War re-enactment groups are the Southern Skirmish Association, Soskan, and the American Civil War Society the A.C.W.S. For information about joining Soskan write to, The Secretary, Southern Skirmish Association, PO Box 485, Swindon SN2 6BF. As this book went to press Soskan had the following Northern Southern units, for prospective recruits to choose from. The 24th Michigan can also be contacted directly by writing to Mark Gregory 82 Bricrly Street, Bury, Lancashire BL9 9HW. Phone: 01617052433. 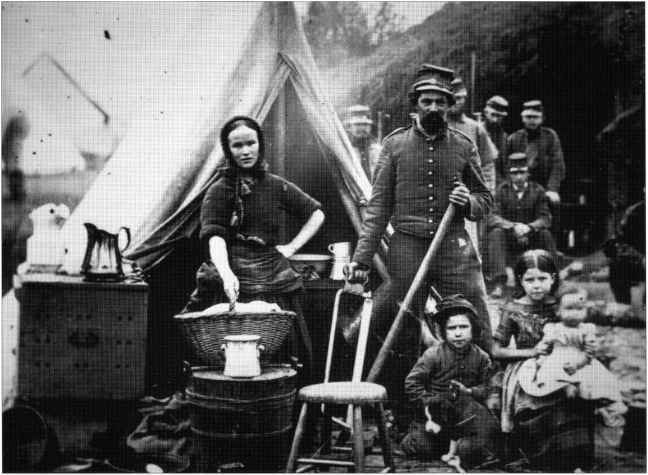 Soldier of 31st Pennsylvania Infantry with family in camp Slocum, near Washington DC c.1861. Peter Newark's Military Pictures / M. Brady. Widely acclaimed as Britain's finest American Civil War reenactment group, the 55th Virginia Infantry is an independent unit and not a member of either Soskan or the A.C.W.S. The 55th is noted for the excellence of its drill displays, authentic dress, accoutrements, and encampments. For information write to: Richard O'Sullivan, Flat 11, Grove Lodge, Crescent Grove, Clapham Common, London SW4 7AE. Phone: 01716224109.